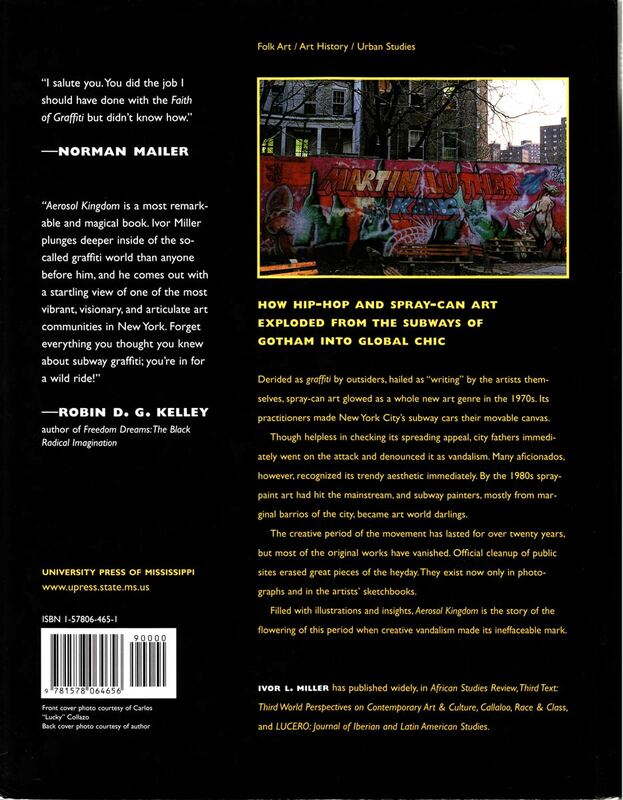 How hip-hop and spray-can art exploded from the subways of Gotham into global chic 6/4/2012 University Press of Mississippi: "As the artists wielded their spray cans, they expressed their acute social consciousness. Aerosol Kingdom documents their careers and records the reflections of key figures in the movement. It examines converging forces that made aerosol art possible--the immigration of Caribbean peoples, the reinforcing presence of black American working-class styles and fashions, the effects of advertising on children, the mass marketing of spray cans, and the popular protests of the 1960s and '70s against racism, sexism, classism, and war. " Doze Green. "Ghetto Resilient," 1998. Triptych. Acrylic on canvas. 3'x1'. Courtesy of the artist. Was subway graffiti art a propellant for the Hip Hop explosion? 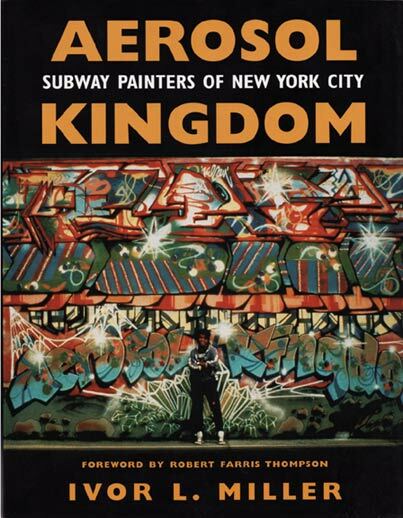 Aerosol Kingdom: Subway Painters of New York City, a new book from Ivor L. Miller says "YES!" New York's graffiti "problem" ignited a worldwide, Hip Hop art explosion! When New York City youths started spray painting subway cars, their markings were acts of rebellion and defiant communications between neighborhoods. Ivor L. Miller, author of the new book Aerosol Kingdom: Subway Painters of New York City (University Press of Mississippi), says the impact on the art world was immediate. Miller writes, "The illegal and rebellious nature of this form caused it to be, on the one hand, attacked by the city administration and on the other celebrated by artists who recognized its aesthetic value." From a vast array of inherited traditions and gritty urban lifestyles, talented and renegade young New Yorkers spawned a culture of their own, a balloon-lettered shout heralding the coming of Hip Hop. "Through their activities the subway painters remapped the city," Miller writes. "By visually communicating via the trains, they drew attention to the city's marginal neighborhoods and the nature of life on the streets." By the 1980s spray-paint art had hit the mainstream, and subway painters became art world darlings. Aerosol Kingdom documents the careers of the graffiteros and records the reflections of many key figures in the movement. The creative period of the movement has lasted for over twenty years, but most of the original works have vanished. Official cleanup of public sites erased great pieces of the heyday. They exist now only in photographs and in the artists' sketchbooks. These are the sources Miller used to illustrate his book. In a foreword to Aerosol Kingdom, Robert Farris Thompson writes, "The best graffiteros--all in this book--are also strong artists, setting off shock waves of mimesis and enthusiasm. The intelligence and the heart behind these calligrapher-writers will change many minds. The maturity of the idiom and the seriousness of the writers come through in this book like no other I know. It's aerosol gold." and Martha Cooper (Subway Art/ Hip Hop Files). "Unlike academics who study rap, a serious graf scholar can't simply flip on BET for raw material. Ivor L. Miller's Aerosol Kingdom: Subway Painters of New York City is the product of a 15 year journey through the New York scene, capturing his sense of awe and admiration for the risk, skill, and ambition of the graf-writers on every lavishly illustrated page." "..the book appears like a freshly painted 5 roaring out of the tunnel onto a Bronx el, a Flash of the Spirit for the hip-hop gen. Soon after embarking on the study, Miller tossed out his theories and decided his job was to act as interpreter and disseminator. The result is an unprecedented record of grafs subway years, told in interviews with artists like BLADE, James TOP, DOZE, the IZ and the WIZ- writers whose names have become myth but whose stories have not." November 22 -23, 2002: The New York University Institute of African American Affairs saluted Ivor Miller and his book: Aerosol Kingdom! Day 1: Discussion, Q&A, Panel and Book Signing. Ivor Miller moderated a panel featuring: LEE, DAZE, DURO, FUTURA, PHASE TOO, VULCAN and LADY PINK. Day 2: Slide presentations from Schmidlapp, VULCAN, and Charlie Ahearn..